Marriage has but one enemy—pride. It decays a marriage from the inside out. Where pride resides, intimacy cannot be found. True connection cannot be formed. Health cannot be developed. Marriages flourish in humility. In the absence of self-righteousness, self-sufficiency, and self-reliance, marriages have the ability to thrive. In the presence of all the “selfs” nothing but selfishness can grow. The answer to pride is what the Apostle Paul calls “sober judgment.” It’s a call to thinking of ourselves without delusion or deception. Sober judgment is serious judgment. It’s a truthful understanding of who we are. The call to sober judgment implies that humanity often lacks that kind of thinking. It reveals to us that we are drunk on ourselves. We are intoxicated with ourselves. We may not claim to be god, but we act like one at the house. We may not see ourselves as better than everyone, but we do see ourselves as better than some. We may not consider ourselves above all tasks, but there are many jobs beneath us. We are intoxicated with ourselves. Many of us are high-functioning drunks. No one would guess our inebriation. To everyone else we look humble and others-focused. We serve, but what others can’t see is that we are serving to earn their approval. We give, but we give in order to appear giving. We are doing all the right things but for all the wrong reasons. We are drunk on ourselves and no one knows it. Some are happy drunks. Our intoxication with ourselves causes us to believe that we can do no wrong. We enjoy ourselves and assume everyone else enjoys us as well. We are happy as long as everyone else recognizes our superiority. Some are weepy drunks. Our intoxication with ourselves causes us to believe that we can’t do anything right. Very few people identify our problem as pride. It expresses itself as insecurity. It’s a false humility. We say things like, “Oh, I can’t do anything right.” “I’m no good.” People run from us because of our sad stories and our need to play the role of the victim. It seems the exact opposite of the arrogant superstar, but it’s just a different symptom of the same syndrome. We are intoxicated with ourselves. When a police officer wants to test the intoxication of a driver, they ask them to do a simple task—walk a straight line, touch your nose, recite the alphabet. Intoxication has a simple effect—it makes simple tasks difficult. It impairs our ability. It makes the most routine situations difficult. Is marriage hard or are we so intoxicated with ourselves that it has taken the easy task—to love—and made it difficult? It’s not hard to give mercy to others if we have a sober judgment about ourselves, but when we are impaired, it can be difficult. Service is second-nature when we understand our need for help, but when we think we are self-sufficient, we believe others shouldn’t need our assistance. A sign that we are drunk is our difficulty doing things which seem easy in God’s kingdom. Love, mercy, grace, peace, forgiveness are not difficult until pride impairs our ability. Marriage only has one enemy—pride. It’s our intoxication with ourselves which hinders our ability to give and receive love. The antidote to pride is sober judgment. When we think rightly about ourselves, we understand our own need for grace. 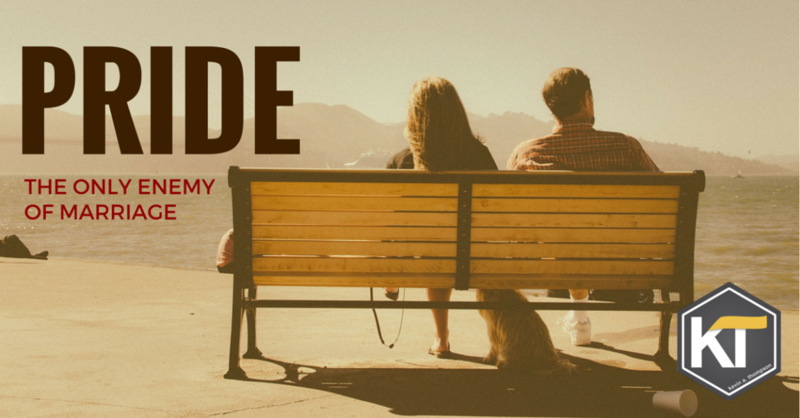 What aspect of marriage should be easy, but because of pride has become difficult? This is absolutely true, Wow, and We walk through life or at least most of Us do Drunk on Our self and not even realizing that most of the problems we encounter from day to day is simply because of Our lack of knowledge in Our own selfishness. Kevin Thompson done a wonderful job at describing this in simple terms so everyone who reads the message can take a bit of the lesson and apply it to all situations and really examine Our inner self to see if we are the problem before dealing with others. Thanks Kevin I also passed this along to a friend that has some forgiveness issues and I posed the question in a not so polite way I guess as to who is it she really needs to forgive, She blames Her husband and kids for hurt feelings or what she sees as an act of betrayal and in all reality I am not there to witness so I can not say but she has been dealing with the problem for a long time now and says she has forgiven them but not letting walls down so she won’t get hurt. I responded that Forgiveness is not hiding behind walls that She has to Forgive all the way meaning it is over, gone, done with and never to be brought back up. I told Her otherwise it is not Forgiveness and She should forgive herself first and foremost, this is an act We all need to keep in mind until you forgive yourself you can not fully forgive others that is why she and a lot of people keep hanging on to even little parts of past to dangle when convenient that is NOT true forgiveness and will destroy a relationship of any kind, I told Her that the choice of course is Hers and how things turn out is up to Her willingness to be honest with Herself first, A lot of Us are not honest with OUR self and so when someone is it Offends us so we don’t deal with it or avoid the people who offended us. This is where anyone reading this and gets the feeling I am telling the truth can say Amen! But in all reality if You just take a few moments and step up to mirror look at Your self through others eyes You will see exactly what they are seeing and telling you, it is out of love and respect when family and friends tell you this because they know the person way down deep inside that wants to come out but can’t all because of fear of letting go of pride, selfishness, as Kevin described it Drunken state of being and in the bible it does describe the Drunken or Drunkard’s as Jesus saw and called them, most folks relate this to alcoholism but I am not sure many back in those times had access to alcohol so I will leave that to everyone’s own opinion but maybe it relates much to how this article is written to describe what God calls Drunkard’s and to that I hope more folks read this. Thanks Kevin for your plain and simple description and understanding. Trackback: 5 Ways:How to make Marriage Divorce Proof? this is really interesting! I am a betrayed wife of a husband who is so stuck in his own shame and sense of loneliness after betraying/lying for 3 months with a co-worker that it’s baffling. I’ve wanted and worked hard to forgive and heal, but he has blamed me, wants nothing to do with God etc. I have such compassion for him, but he, in his pain – is unable to reach out to be there for me whatsoever. He runs to everything and everyone but his wife who loves and wants him to heal. He’d rather wallow than man up. Talk about the other side of pride! Shame, but it’s effects are the same. It’s heartbreaking. After 15 months, I’m filing for divorce. I can’t force someone to return to me. I understand the heart of God a bit more…how he must suffer as the ones he loves forsake the fountain of living waters to hue out broken cisterns for themselves. I hope one day God will either restore both of us. On anther note, what’s your take on Midlife crisis? Myth or just a synonym for sin? I think it’s real, but how many people respond to it is sinful. It’s natural to transition into a new season with some fear and questions. It doesn’t not excuse sinful behavior. It’s good to reinvent yourself, but it’s not right to forget your vows and responsibilities. I can’t get over how on point this article is! Thank you SO much for posting.